Christmas is an extra special time of year when loved ones gather to share gifts and loving memories. The magic of Christmas seen through a child's eyes is one of life's special moments. Sandra's Christmas depictions remind us of the joy, wonderment and beauty that a child experiences at Christmas time. 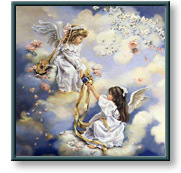 Gift of Giving comes only in an open edition poster, making it an affordable gift for any admirer of Sandra Kuck's angel prints. Please add $5 for shipping & handling. Gift of Giving copyright © 1998 by Sandra Kuck is prohibited from being copied.